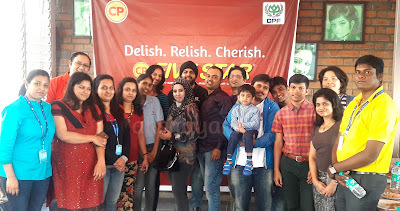 Another bright morning in my favourite foodie city of Bangalore; and my next meet with the Food Bloggers Association of Bangalore(FBAB) at Five Star Chicken, CPF Tower, Indira Nagar. My first point of apprehension as with any vegetarian, or a non-meat eater was, would there be enough veg options for me to review? But a foodie at heart, must play the part!! The venue was pretty easy to locate, right on the foodilicious 100ft road of Indira Nagar, opposite Dominos. On the outside, it would appear to be a simple take-away outlet. We were ushered up to the 4th floor. 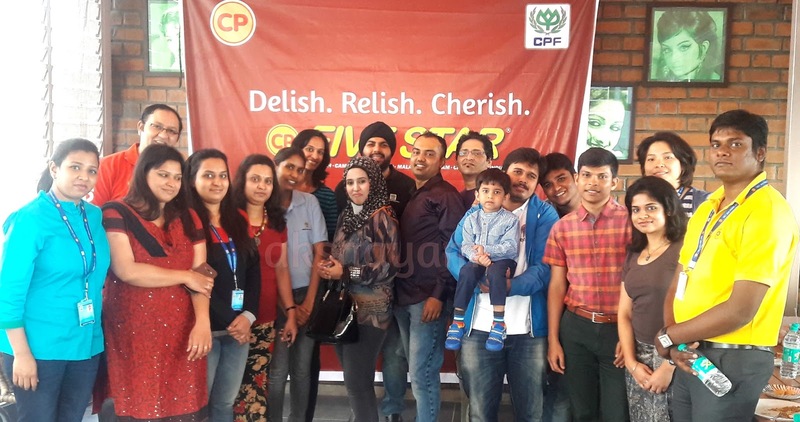 The team informed us that the entire building housed CP (Charoen Pokphand) Foods, a pioneer in the food industry with representation in as many as nine countries. 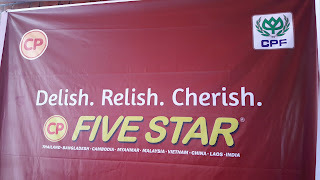 Five Star Chicken, as a brand is already claimed to be popular in many countries in Asia and a good presence in India too. 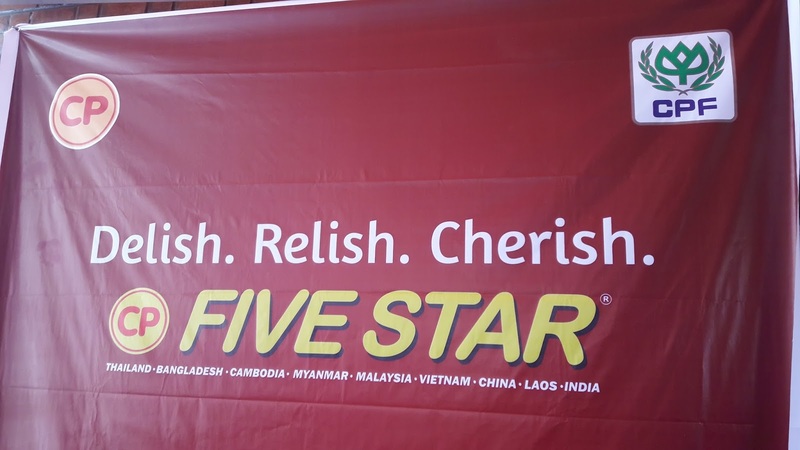 We were also informed that the brand renaming to Five Star Cafe was done with a view to attract more vegetarians and dilute the typical image of it being a meat-lovers' hub. After a brief intro by the solicitous Five Star team, the goodies started arriving!! 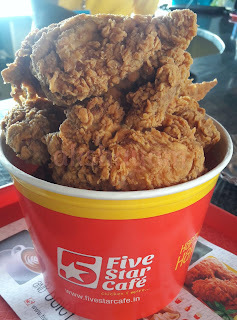 The first one to make its appearance was Thai Crispy Chicken. First impression, as the name suggested, crispy. A couple co-members liked the flavour too. 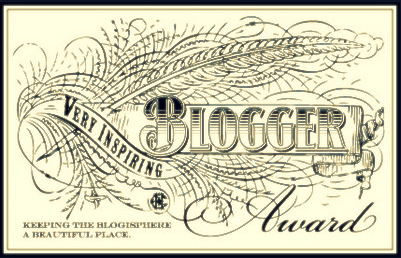 (I shall leave the taste review to those who actually tasted it!!) Likewise for the Crunchy masala chicken. The flaky crust had me wondering if it was muesli-coated. But Chef Prabhmeet surprised us by saying no! The actual formula is apparently a Five Star special technique, all we could glean out of the chef was that it was refined flour-based!! Hmmm...'crunch for thought'!! Eventually the veg offerings came our way. Veg burger to begin with. 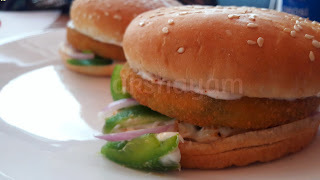 One has a certain expectation of a burger; crunchy patty, soft bun, generous mayo or cheese and few layers of veggies. The five-star Veg burger did fulfil that expectation to an extent, however they could go a bit easy with the onions, as they tend to over-power the rest of the flavours, and maybe add a dash of crisp lettuce (which for me is a sure-killer burger ingredient). That said, this burger would do well to satisfy that quick in-between appetite, or be good in a friends' meet platter, but I wouldn't term it a conversation-stopper. There is also the Veg Roll, which is stuffed with a crisp patty (sliced to fit into the roll), capsicum and onion rings. The roll has good promise, in my humble opinion, they could perhaps build on this further to make it more filling, or experiment with different fillings. Typically a veg (or non-veg for that matter!!) roll reveals its wares with each bite, so would be interested to know if they take this further in their culinary future. Next on the list, Aloo Paratha. Mildly spiced, not too oily, the paratha was certainly soft and easy on the bite. A true Indian foodie though visualises a paratha as much more. 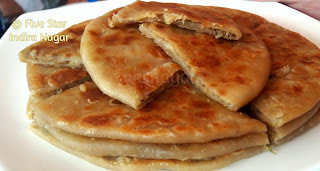 The parathas could do with a little more generosity in terms of stuffing, spices, and richness of the crust, but less dough in the bite. The Veg Pulao was quite agreeable. 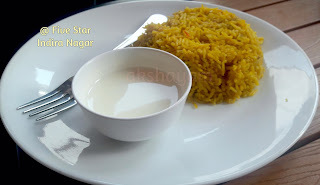 Served with the humble onion raita, the rice was cooked just right, and the spice-level was great, which really brought out the flavours well. Not much of a rice fan, I did help myself to a few more fork-fuls this time!! 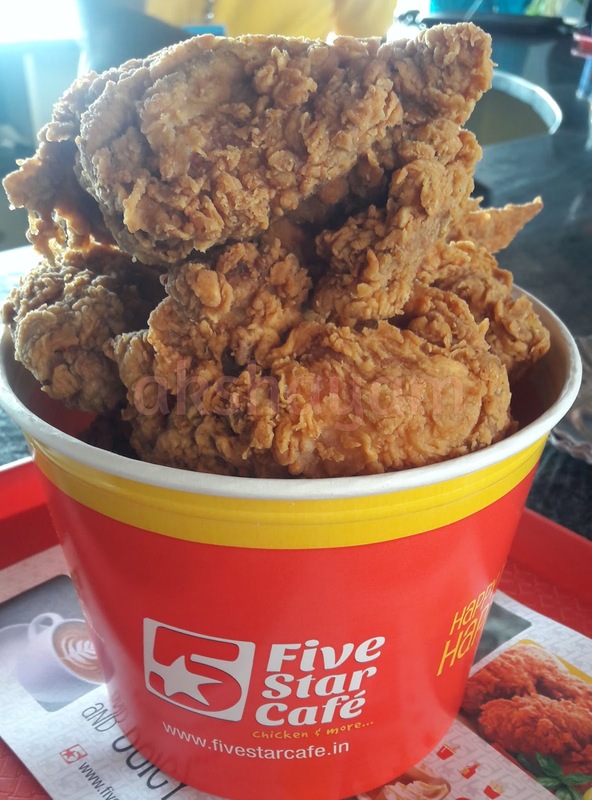 I must mention here for those who might enter Five Star with hung-over visions from other fast-food joints, the option of having a complete meal is definitely there. 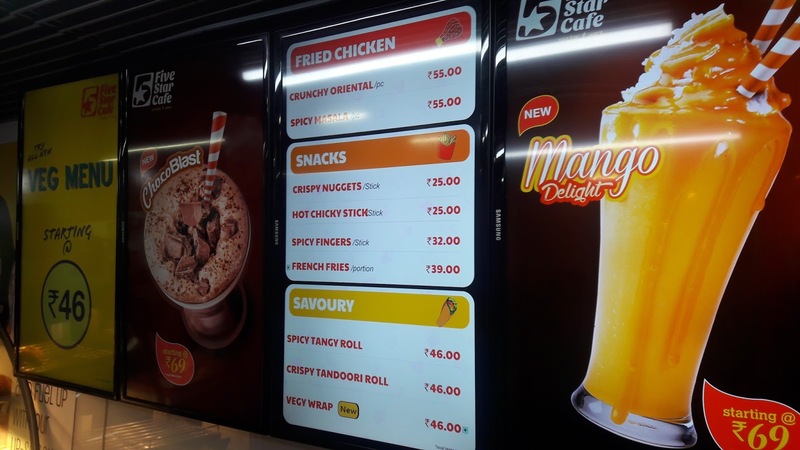 But the true stars of the menu that can make any adult scramble around for more, were the Peri Peri fries and Cheese Corn Nuggets. The fries were not too oily, were quite crisp, and where we are used to the salted version, the light sprinkling of the Peri-peri spice was pretty awesome. They weren't too hot and certainly didn't make me reach for my chilled drink, but I did reach out for a few more fries!!! The corn nuggets were another delight, the team claimed that it was one of their fast-moving and more popular offerings. They were really crunchy and one is able to detect and delight in the killer-combo of mozzarella and corn. Note of caution : If you are in a group, and would like to have more than one, order plenty, coz the plate will be wiped clean in a blink!! All in all, the Five Star outlet, and brand look set to grow. The outlet is a wi-fi enabled zone, so one can socialize in every way!! 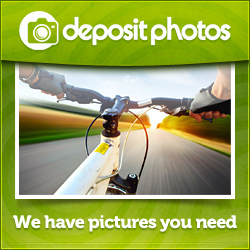 The staff is friendly, helpful and courteous. Outside seating is available at this venue as well. Would I come back for more? I would indeed!!! Last but not the least, it was yet another amazing outing with the FBAB team, chatted up new and caught up with the old members. Had good fun the foodie way - Click, taste, review.